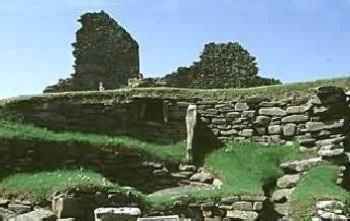 Old House of Sumburgh was possibly a medieval stone farmhouse, which came under the control of the Scottish lairds, in the mid 15th century. Rebuilt in the 16th century, the New Hall at Jarlshof was a defensible laird's house, which was modernized in the early 17th century, with a large first floor hall. Built on one of the most interesting archaeological sites in Europe, the house was a ruin by the late 17th century. 24 miles north is Scalloway Castle. Old House of Sumburgh is located at Jarlshof, off the A970. 24 miles south of Lerwick, on the A970. For travel information go to Shetland.org. The site is owned by Historic Scotland and is open daily, April to September 9:30-5:30pm.